While we are all eagerly anticipating the arrival of the much rumoured HTC One 2, that's not the only smartphone the Taiwanese firm appears to be working on. Chinese site MyDrivers seems to have spilled the beans on a handset dubbed the HTC Desire 8, with a variety of specs and an accompanying image. The firm is looking to expand its smartphone offering with Jeff Gordon, HTC's Senior Global Online Communications Manager, tweeting, "It's important for HTC to have a complete, competitive range across price points. Lots more to come!" According to the leak, the Desire 8 will feature a 5.5-inch display, a decent sounding 13MP rear camera and an equally impressive-on-paper 5MP front snapper. 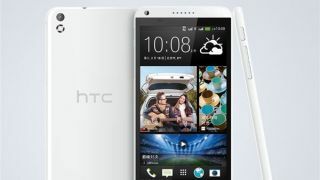 If the leaked image is to be believed then the HTC Desire 8 is set to sport a minimalist, clean design - apparently favouring plastic over the metal found on the HTC One, we assume to keep the cost of the handset down. There are small front-facing grills, but the Desire 8 may just have the one front facing speaking, with the holes at the top of the handset potentially hiding an earpiece only, instead of the double Boomsound setup we get on the flagship One. The HTC Desire 8 could be announced at MWC 2014 in Barcelona at the end of February, and we'll be there to bring you all the latest. What will the new HTC One be like?